Yet another disappointment. I found very little to like in this set of stories. I'm familiar with some of the authors. Naturally, a few of the stories I found palatable were by the authors I like. Some of the stories I found just plain confusing or uninteresting and easily forgettable. On a MST3K list, there was a game to explain the premise of a movie in five sentences. I shall incorporate the idea of that game and describe the story in one sentence along with another sentence to describe my reaction to it. Here goes. "The Collage to Kill For" by Susan Wittig Albert - China Bayles, who runs an herb shop and part time sleuths, tries to figure out who killed a tenant who made collages. Tried to read her first book and couldn't get interested in her, the characters, or the story, this one didn't change my mind. "The Gourd, the Bad, and the Ugly" by Maggie Bruce - Think of the shell game played with gourds where the winner comes up with a winning lottery ticket worth millions and the losers walk away with nothing, but it's all for naught. Couldn't get into this one either. 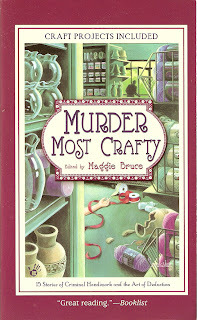 "Call It Macaroni" by Jan Burke - Thanks to a broken arm, one sister has to cover for the other sister for this crafts project and decides to go the simple route via macaroni instead of resin, oh, and a possible murder happens somewhere. When will this torture end? "If You Meet the Buddha" by Susan Dunlap - This guy sews a garment for the Buddha as he's hiding out from the fallout of a mob hit. What the heck was this?! "Strung Out" by Monica Ferris and Denise Williams - Parents find a marijuana seedling in their son's room, but he insists it's not his and Betsy steps in to find the culprit. Finally, an author I like and a story that's better than what I've read so far. "Oh, What a Tangled Lanyard We Weave" Parnell Hall - A coach is strangled with his lanyard, while the police think they have the killer, Hastings isn't so sure and uncovers the lies surrounding the murder. This story could easily have been cut down by a third and nothing would be missing. "The M Word" by Judith Kelman - A basket weaving contest ends in murder or does it? I don't get and I'm not willing to waste the brain cells to try to figure this story out. "Bewreathed" by Margaret Maron - It's New Year's Eve and the family's celebrating and pondering the mysterious robberies plaguing their small town until they figure out who and how it was done. I think this one's my favorite in the whole book because it had mystery, suspense, and romance. "The Deepest Blue" by Sujata Massey - A Japanese fabric supplier runs across a unique indigo fabric and wants to know more about, but ends up opening old wounds. Not much to say about this one except it seemed more of a closure story then a mystery. "Waxing Moon" by Tim Myers - Harrison uncovers who stole money from the caterer. I really like Myers story and he didn't disappoint me with this one. "Light Her Way Home" by Sharon Newman - The Anchoress dies and a couple figure out who did and why. I don't remember the names, but it was a better mystery than most of the stories in this one. "Ellie's Chair" by Gillian Roberts - A furniture restorer finds the chair of an old friend, restores it, and uncovers murder. This one dragged on a little too long as the narrator tended to go on and on about how she annoyed people because she was content, no, she annoyed people because she kept reminding the reader she annoyed people. "Motherwit and Tea Cakes" by Paula L. Wood - Motherwit moves from New York to California and comes across Medicare fraud. This didn't have much to do with crafts except for making a collage for a dog, mystery was shaky, characters were flat, and what the heck do tea cakes have to do with crafts?! Overall, not very good for an anthology. Maybe five good stories out of seventeen. Of course, that's my opinion, others will vary, I'm sure. were these "straight" murder-mysteries, or was there an element of the supernatural in them? They were "straight" nothing supernatural about the whole thing. Maybe that would've helped some of the stories. However, I'm finishing up Catopolis and will be posting Catfantastic! soon which have supernatural elements in them and both are edited by Greenberg. i think MMC may have been doomed from the start. a good murder-mystery takes time (= pages) to develop. when you're only allotted, say, 10-15 pages for your whole story, that's pretty rough. you've gotta introduce a person, kill him off, introduce several potential suspects, develop their characters a bit, sprinkle in a few clues, and have the perp get his just desserts. all in 15 pages? and make it a memorable story? uh-uh. ain't gonna happen. I think you nailed it! When I read the first story, I thought it felt rushed and the other stories which followed didn't help it. Some mysteries need exploration and depth and I don't think the ten-fifteen pages could accomplish it or the authors put more introspective when was not necessary. However, the editor (Bruce) should've caught this. It seems like you confirmed my suspicion that the stories should've been longer or different all together, especially the ones that didn't have a craft associated with it or didn't make sense. yep. i think the supernatural element allows for a lot more twists in the story, so a memorable 10-pager is possible. i've got an anthology called "Alternate Warriors" on my TBR shelf. 30 stories; 430 pages; all with the same theme - men and women of peace re-cast as warriors. (probably) nothing supernatural. it scares me to think how bad this book might be, and how repetitive the theme will be.